A cell phone is essential for keeping the lines of communication flowing freely from the farm. 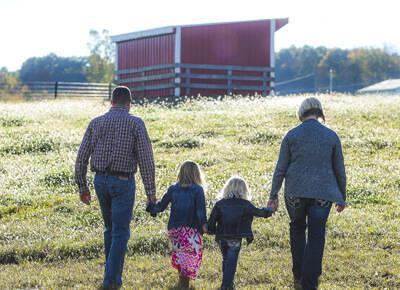 Most kids save up their allowance dreaming of a stereo or car, but not Aaron Atterholt and his brother, Mike, who planned and saved to buy Angus cattle, furthering their dream of building a family farm in rural Ohio. Their vision is now a reality, as the brothers, their wives and children are continuing a family legacy started by their great-grandparents. 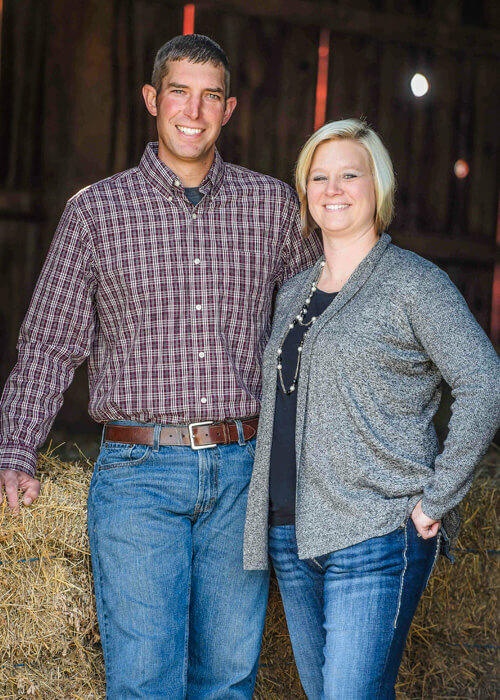 Aaron’s wife Mandy, a graduate of The Ohio State University, is part of the Certified Angus Beef ® brand team, where she arranges tours to her family farm and others throughout the country for brand partners and Culinary Center guests. 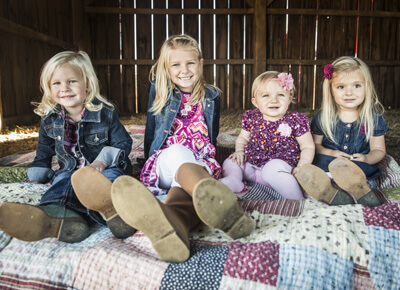 How is farming a family affair? Aaron and Mike are the first generation to make farming a full-time career. 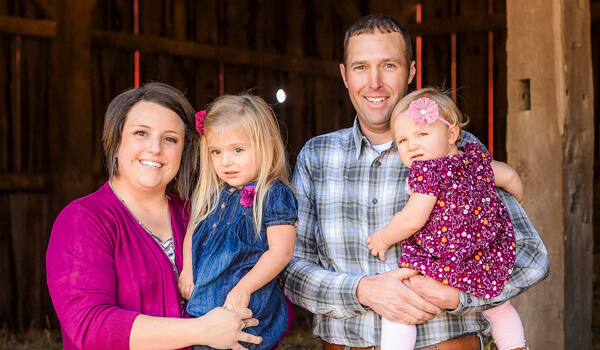 Aaron and Mandy, with their two daughters, live on a farm first owned by his grandparents. Mike’s family farm has an even older history, started by their great-grandparents. Although there’s always plenty to do on the farm, both Mandys work outside the farm, too. One is a physical therapist assistant and volunteers with local 4-H groups. The other was a high school agricultural education teacher for 10 years, so sharing her love of farming comes very naturally.  The Atterholts know a “go with the flow” attitude is necessary to roll with the punches and adjust to factors outside their control. What’s the best time of the year on the farm? 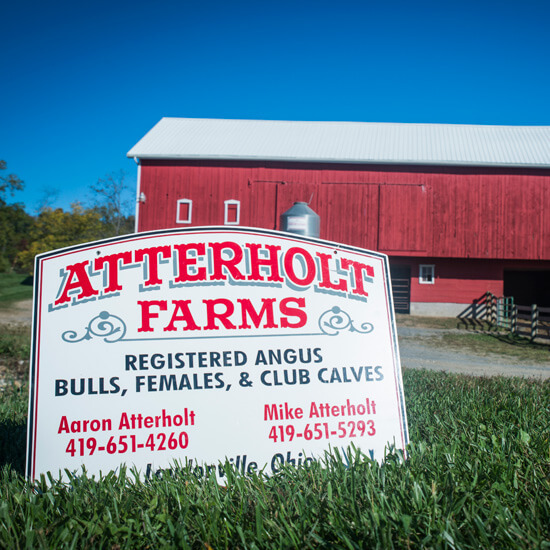 Between the families, the Atterholts have 700 acres of crops (corn, soybeans, wheat and hay) and about 80 Angus cows. Balancing the needs of cattle and crops is a dance they do daily, but calving season – January through March – is a special time of year, when there are newborn calves that need care. Come spring, the calves move to pasture with their mothers, and the families have more time to focus on planting crops. Fall brings weaning season for the growing calves, and harvest season for the crops. Regardless of the season or weather, the Atterholts are doing what they love! The cattle are the center of attention at the farm. Without the stars of the show, there’d be a lot fewer visitors.